HOUSTON: Court Boots Bid To Stop Drag Queen Story Hour, Haters Launch $500,000 Ad Campaign [VIDEO] - Joe.My.God. 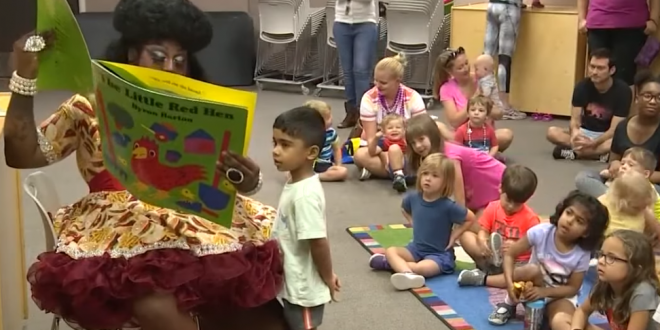 A federal judge in Houston swiftly ended a chapter Wednesday for a group of conservative Christian activists seeking to stop the Drag Queen Story Hour at a local public library. Chief U.S. District Judge Lee H. Rosenthal put it simply in her four sentence order, issued just days after the lawsuit — blasting gay marriage and transgender public events— was filed against Mayor Sylvester Turner and Rhea Lawson, the head of the city’s library system. James Woodfill, one the haters, is ever so upset. But Mayor Turner points out that no tax dollars are being used on the program. “It is being housed at one or two libraries, requested by the patrons of those libraries. There are no city tax dollars. It’s a voluntary program. It’s not costing people anything,” Turner said. Woodfill says they have a $500,000 budget to spend on mailers and television ads which are intended to expose the activity that has parents divided. Watch the video for a taste of their hate ads.